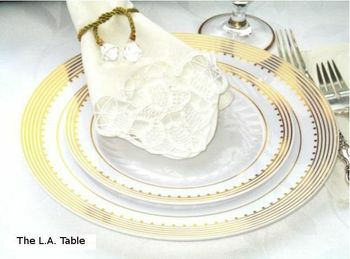 Our beautiful Princess Gold plates are intricately detailed with gold stripes and dots. Their heavyweight plastic will fool your family and friends into thinking you got new china. Salad and dinner plates contast each other perfectly! Set an elegant table for any occasion without the hassle of cleaning up. Elegant enough for weddings, and upscale dinner parties and other upscale events. Premium heavyweight plastic porcelain look reusable or disposable perfect for any occasion excellent quality. Princess Gold 10 1/4" White Dinner Plastic Plates w/ Gold Stripes and Dots 10ct. Princess Gold 7.5" White Plastic Salad Plates w/ Gold Stripes and Dots 10ct. Princess Gold 12oz. White Plastic Bowls w/ Gold Stripes and Dots 10ct.